Article first published as Hardware Review: UClear HBC 130 Helmet Communicator on Blogcritics. It is generally not wise to listen to music nor talk on your mobile phone while biking, but let's face it, if one has a 3-hour, 50-mile ride, many bikers will don a pair of headphones or a bluetooth headset to allow for streaming media or short phone calls for the long journey. Sound quality can vary dramatically with headset microphones in general. Add the dynamic variable of Mother Nature into the mix and many headsets will be rendered useless when confronted with the elements. UClear has chosen to tackle this problem, and their military proven solution comes in the form of the HBC 130 Helmet Communicator. Read on past the jump to see how the device fared. The HBC 130 comes with speaker buds that attach via velcro/adhesive to your helmet instead of fitting snugly in your ears. This allows for hi-fidelity stereo sound without closing out your surroundings. After a brief trip to the power outlet (mine took less than the quoted 2-hour charge time), the small command control unit is readily charged and can be mounted to your helmet as well. The controller can be clipped on and off for easy access. 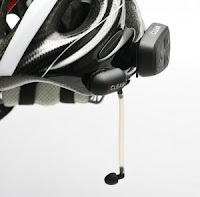 With this setup, the only wires are the ones that can be contained in your helmet, as the controller communicates with your mobile device via a Bluetooth connection. The setup process continues with pairing. If you have ever connected a bluetooth headset to your mobile device, the process will feel quite similar. Power up the command controller, scan for devices on your mobile, and watch as the HBC 130 pairs within a few seconds. At first, I had to wait for the device to stay connected after a few missed attempts, but I had no trouble subsequently, and I wasn't even prompted for the usual "0000" passcode. I'd also like to note that the included user manual was very well organized and easy to follow, a rarity nowadays with new technology often following the IKEA style of lots of pictures, arrows, and few words. Incoming calls were easily handled with the push of a button. I didn't have much luck with the voice activated pick up call feature on my first try, but later attempts did successfully answer the call with a simple "Hello" or "Pick Up". This well designed feature truly makes one's mobile device "hands-free" at least for phone calls. After a click of the answer button on the remote, I also succeeded in making a call using the voice dialer option on my HTC Thunderbolt. Overall, sound quality was solid as the boomless microphones and the wind and noise cancellation technology proved effective even against variable weather. If you and a friend both pick up an HBC 130, you can pair them together for a helmet communicator intercom system. I could definitely see this coming in handy as many riders often head out in tandem or in small groups. Stay within a 10 meter range, and you have a nice communication solution without bulky phones, long wires, or unreliable walkie talkies. Many phones (including the iPhone as of iOS 3.0) now support A2DP which means you'll be able to stream your tunes through the headset. Speaker sound was about what I expected. It wasn't like there was a booming stereo right next to my ears, but it was definitely loud enough in a quiet zone and above average while pedaling on the path. The controller was quite responsive as you can play, stop, fast forward, and backtrack simply by pressing one of the three buttons a combination of 1 or 2 times. As a huge Pandora fan, I was pleased to find that the controls still worked for the streaming radio app. And if I needed to, I could check my calendar, email, or even the news, and still be able to control my music. Bluetooth headsets are nothing new in the world of gadgets and technology. However, a solution for bikers is rare, so UClear may have found a niche that needs filling. With their HBC 130 Helmet Communicator, the company has created a high quality product that provides all of the functionality that one would need from a headset in a lightweight, durable, and full featured product. Long bike rides just became more entertaining as a result. 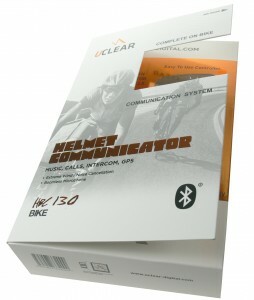 The UClear HBC 130 Helmet Communicator is available for $229.95 direct from uclearstore.com.